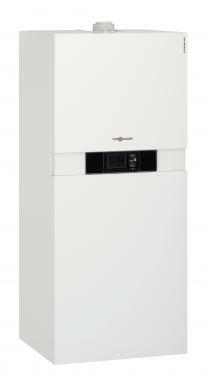 B2TB Vitodens 222-F Storage is a floor standing, combi gas boiler. It has a new, innovative operating system with a colour touch screen and plain text graphic display. Optional accessories enable you to connect the boiler to your home or local wireless network so you can operate it from a mobile device. That’s complete temperature control wherever you are! With its high efficiency, power saving pump and automatic flue gas adaption it is the perfect boiler for those who want the convenience of a combi boiler and with the high demand for hot water. The compact size of 595x600x1425mm makes for an easy and quick installation. This model is also available with 5 years parts and labour warranty on the boiler 10 years warranty on the inox-radial heat exchanger.